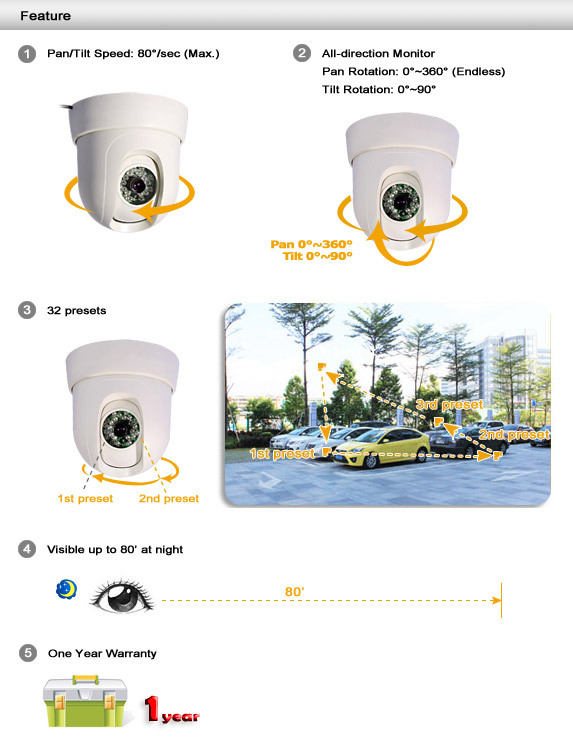 High video quality 1/3" Sony CCD & 32 presets & 8 mm Lens & 360° Pan and 90°Tilt Controllable Rotation & 80°/sec P/T speed & D1 CIF QCIF three image pixels selectable & 24 infrared LEDs 80ft night vision. This indoor Pan Tilt Dome Camera features a 1/3" Sony color CCD sensor and an 8mm focal lens. A resolution of 420TVL and signal-to-noise ratio (greater than 50dB) enables clear and crisp images. The camera offers up to 32 preset viewing points and the RS485 connection. 360° pan rotation allows you to view an object as it moves, without losing track of it. With this Pan Tilt video camera, you can protect your home or business from break-ins, theft, missing inventory, unreliable employees, vandalism, and other suspicious activities indoor. 32 presets allow you to store the key monitoring areas to the memory, and arrange them in the wanted order and dwell time. Keep your entire property secure with an all-encompassing 360 degree view without any blind spots. Under up to 360° pan rotation and up to 90° tilt rotation, this camera can view an object as it moves without losing track of it. Utilizing the pan or tilt speed to max 80 degree for large angle monitoring, or you can adjust the speed as the lowest speed to obtain a stable image. This camera supports up to three types of pixels. Combing with your DVR, you can enjoy clear and crisp image of D1 at 720 x 576 pixels, or choose smooth and still clear image at CIF(352 x 288) or QCIF(176 x 144). Full, true-to-life color picture during the day and black & white infrared-aided picture at night. Cameras can capture images in night vision mode up at 80’ away. The high quality 1/3” Sony® CCD image sensor in this camera provides a clear, crisp and consistent picture at 420 TV lines of resolution. This ensures that you will always clearly see what you are monitoring and allows for better distinction of facial features, which can aid in the positive identification of individuals. Auto White Balance adjusts the signal strength to maintain a constant brightness level. You can also switch the white balance mode into manual mode under suitable conditions. Auto gain control adjusts the sensibility to low light, and enhances the signal strength to achieve clear video image. Via BNC connector, this pan and tilt camera can be easily connected to any ZMODO DVR for remotely viewing it over the internet or simply for storage purposes. Setting up live viewing is simple and hassle-free. This is a Pan Tilt camera, no zoom. BUT it is under a hundred if you wait for sales. when I have this and a bullet camera looking at the same ares, this camera provides a richer color then the bullet. You can even hook up more then one in the same PTZ port. I am still working on how to program them to pan an area automatically. I do wish it came with some instructions on how to program. You can even control this camera via your smart phone. The Pan Tilt, NO zoom, camera work for indoor areas. hookup took about 20 min, worse part was getting settings figured out. for some weird reason, I had to change my parity for it to work right. after that, works fine, I can keep a eye on my house while on vacation or at work. This camera is good value for the money you pay here. It is meant to be used with a DVR or a separate camera joystick that can communicate with it via a PELCO or other type protocol with a RS485 serial connection. The 1 star review in here is from someone who apparently did not understand that and thought this was a network or IP camera. The IR LEDs on this camera are good for illuminating objects within 30 feet. This should be sufficient for the rooms in most people's houses. Don't expect to illuminate the other side of your indoor basketball court if you have one, let alone see it closely without zoom. I mounted mine in the ceiling between two rooms where the wall doesn't go all the way up, so I can see in to both rooms.